According to Wikipedia : Panax quinquefolius, commonly known as American Ginseng and often by its Chinese name Huaqishen is an herbaceous perennial in the ivy family that is commonly used in medicine. It is native to eastern North America, though it also cultivated beyond its range in places such as China.Like Panax ginseng, American ginseng contains dammarane type ginsenosides as the major biologically active constituents. I still have some sliced American Ginseng 花旗参,it's leftover from my confinement (child birth) years ago. Recently my daughter keep having flu and cold for months and she keep asking for soup..Since I still have plenty of American Ginseng in freezer I better utilise it,right? 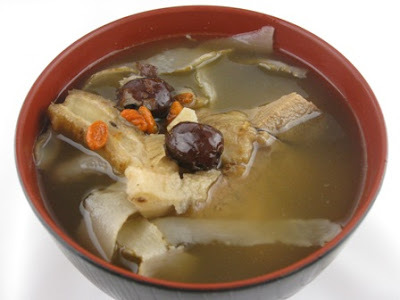 I understand consume American Ginseng soup is good for her body and health . 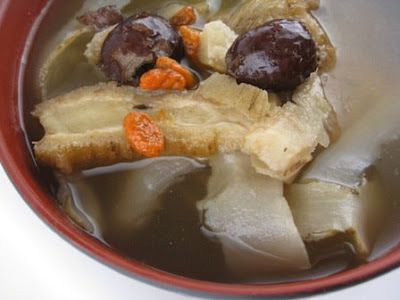 Chinese believed herbal soup is a nourishing and rejuvenating oneself.I would like to share my simple soup recipe with you. 1: Wash and blanch pork in bone with hot water. (I prefer to use pork in bone rather than ribs coz ribs have too much fats).Wash and drain all herbs in a small bowl,set aside. 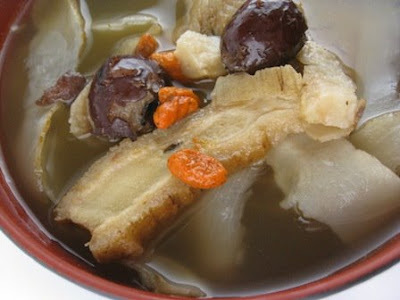 2: Use a medium large stock pot with water at high heat.Add in pork in bone in the stock pot and let it cook until rolling boil.Then add in America Ginseng,gojiberry,red pitted dates and solomonseal rhizome into the stock.When the stock rolling boil,reduce heat to medium.Cover with lid,let's it simmer for 45 minutes or longer.The longer it's simmer,the better it's taste. 3: Add in salt to your taste and let's simmer for another 20 minutes before shut off the heat.Dish out and serve warm. 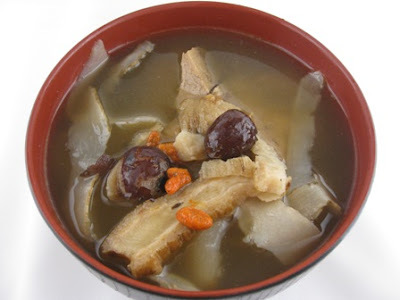 This soup taste a bit bitter due to the infusion of America Ginseng. So it's advisable NOT to add too much ginseng.You can request the whole ginseng to be slice when you purchase at the store .In my opinion whole ginseng quality is much better than the ready sliced ginseng in box on the shelve. Also beware when purchasing America ginseng ,make sure it's not fake coz the demand of wild ginseng is so high, they just replaced with any ginseng to meet the demand. What a homey and nutritious soup! Nowadays, it is always a risk that those Chinese herbs we buy can be fake ones. Sometimes, I just dunno know to tell the diff. This could cure any cold! I have never cooked with ginseng, now I am going to hunt some down and try it! Also what is and where would I find solomonseal rhizome? I have never heard of it. you're right!! it's hard to tell what is real and fake AG..I usually go to reputatable herbal store and asking around ppl/vendor in Chinatown..I ask them to recomand where to buy herbs..They are the best ppl to ask!! solomonseal rhizome is white color strip ..You can see from my photo next to American ginseng..Actually you can eat solomonseal rhizome,it's taste semi sweet ..Hope you can find the right herbs in Chinatown..